"My commitment to my clients is to always help them identify their goals and provide them the most current information and effective solutions to reach their goals. I believe that honesty and integrity are the most important parts of developing long-term relationships with my clients and their families." LPL Financial Advisor Jeffrey A. May is committed to helping you pursue your financial objectives. As your goals change over time, Jeff will actively monitor your investments and work closely with you to formulate an individualized roadmap to help you invest, diversify your holdings and pursue your plans for the future. Serving Western Kentucky and surrounding communities, Jeff has 16 years of experience and has been with Old National Investments for one year. He received a bachelor's degree in finance and master's degree in business administration from University of Southern Indiana. 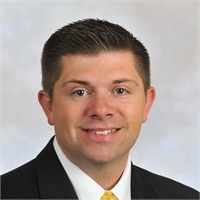 Jeff is actively involved in the community, especially with Junior Achievement, Habitat for Humanity, Crossroads Christian Church, Chamber of Commerce, Southern Indiana Builders Association and SIBA Young Professionals Council. A native of the Evansville and Tri-State area, he is an avid golfer and Colts fan who participates in multiple nonprofit organizations and boards.